A beautiful 19th century neoclassical Grand Tour patinated and gilt bronze model of the Medici Lion, standing on a Carrara and griotte marble plinth. With magnificent form, the patinated dark brown lion is seen keeping one paw on a gilt ball. 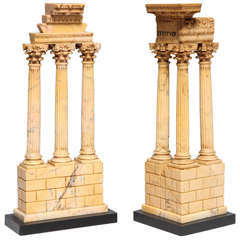 The gorgeous plinth is hand carved and hand-chiseled with two layers of flawless Carrara marble and one large rectangular section of griotte marble with white inclusions. Rome, Italy, circa 1840. 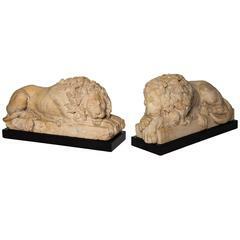 Pair of serpentine Grand Tour lions. Austrian bronze grand tour model of The Discobolus of Myron, of the best quality casting, raised on an oval marble plinth with acid etched stamp "Made in Austria".